As most of you who regularly read my musings know, I first started practicing yoga in Gisborne, Aotearoa, NZ, in 1992. In those days just as today, the first thing you needed to do when you decided to get serious about yoga was to buy your own yoga mat. 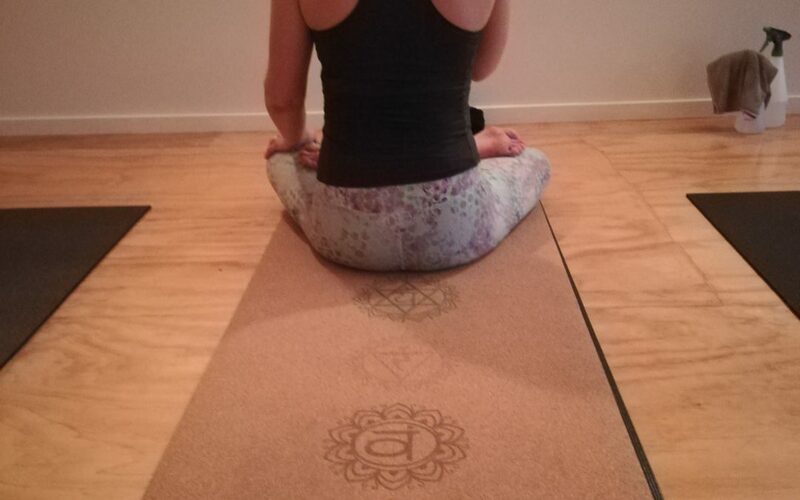 I seem to remember that one of the women who has been doing yoga for a while in Gisborne would buy mats in bulk and we would buy them off her. People today would recognise my first mat as what it was, but other than understanding it was a “yoga mat” they would see very little in common with the mats we have today. My first mat was barely 2mm thick, it was wider than the mats we tend to practice on today and it was white, which in my case, soon turned to a dirty grey colour. In the excitement of my early passion for my yoga practice, this mat became the most precious of my possessions. It traveled everywhere with me. It came with me on my first trip to Mysore. I sweated buckets into that mat and it was so slippery when wet, that my first job when I got to Mysore was to go to the Govt. Kardi shop to buy a prison cotton mat to put on top of my white one. This was my first experience of shopping in India and I learned that not matter how desperately you pointed to the mat that you wanted behind the counter, you would be required to look at 20 other mats before the shop attendant was willing to actually pull out the one you wanted. So it’s like, “that brown one there please” (pointing directly at a brown mat about 12 mats down from the top). The dude pulls out a blue one that is 15 down. “No, no, that brown one that is a couple up from that one.” The dude pulls out a green one that is 8 down from the top. Any how, you get the picture. Basically you spend 40 minutes to complete a transaction that should take 5 with the shop keeper all the time smiling and wagging his head so that it is hard to get angry with him unless you have been in India too long. I became firmly attached to both my white mat and my brown cotton mat. I totally believed that I was pouring my “shakti”/ sacred energy into both and did not want to stop using them. In the end, the white mat had 2 holes where my feet landed when jumping back and I had turned the mat over and switched it around, so there were 2 holes at the front of it as well. In the 25 years since then, yoga mats have come a long, long way. First they got thicker. Then they got narrower. Then they came in different colours. Then they got patterns on them. Then they got “branded”. I have pretty much tried them all because once I got over my attachment to my first mat, I was happy just to practice on whatever mat I could get and afford. So I have been through the mats that crumble and put “mat dandruff” everywhere, the ones that have a layer peel off them in great chunks and the 5mm extra long, last forever landing pads. About 9 weeks ago, I was contacted by Danny Garg, a kiwi local, about some new “eco-friendly” cork yoga mats he was producing and would I be interested in trying one. This immediately appealed to me on 2 fronts. The first is that I try always to support local businesses over international ones. The second is that I prefer to use something that does not have a bad effect on the planet. After all, this is the only planet we have for the foreseeable future, so it makes sense to look after it if you can. I said yes, and Danny sent me a mat to try. I can honestly say that Danny’s “Valka” cork yoga mat is the best mat I have ever used. The cork just feels really nice on the hands and feet to practice on. It is smooth and yet it is not at all slippery. I am a sweater when I practice. I don’t sweat as much as I used to, but I sweat and the beauty of the “Valka” cork mats is that they are more sticky when they are wet. I pretty much don’t have to use a cotton mat any more. I am a 1.81m. 75kg. Male, so I am hard on mats. So far, my “Valka” mat is showing no signs of wear at all. It is quite thin, so rolls up compactly, and not too heavy so will be a good mat to travel with. I practice on carpet sometimes and I was worried that I would have to put a mat under the cork one to maintain the firmness that I like. I was pleasantly surprised that this was not the case. And of course the best thing is that it is fully biodegradable. What more could you ask for in a yoga mat. 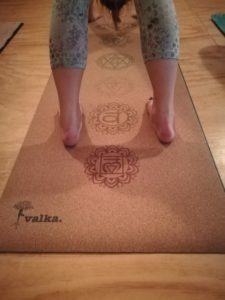 I thoroughly recommend the “Valka” mats, so check out their web site if you are interested. We are also stocking them at Te Aro Astanga Yoga if you want to buy one directly from us. As a Christmas treat we are also running a competition to give one mat to some lucky person. Have a look at our Facebook page to enter. Click here.